The N.A.P. offered a rich array of support services to artists and organizations wanting to provide arts and culture programming across the city. Among the most popular was the Print and Design Shop. Located at one time in the SOMArts building, the design shop provided free design services to people in need of flyers, posters, event programs, or other printed materials. Community members could bring in their copy-ready posters, or simply bring in an idea for a flyer, and design staff would design it for them. Printing services were free if they brought their own ream of paper. The Print and Design Shop was prolific. 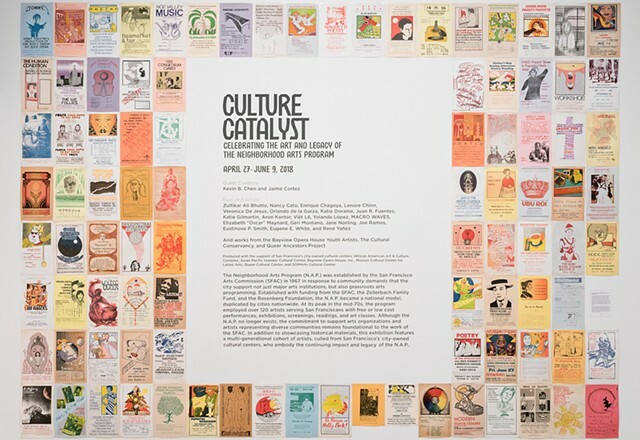 At its peak in the mid-70s, the shop annually served three thousand artists and independent arts groups and printed 1.5 million copies and promotional flyers. Large as it is, this mass display of event posters from the 70s and 80s gives but a small taste of the extraordinary artistic vibrancy that N.A.P. unleashed and supported.